I'm not sure what is required for a blogger introduction, but let's skip lame introductions for the moment. I already have to worry about my Facebook profile being published without my consent. Plus, someday I'll be able to post a FAQ with all the questions that I imagine all you glass souls are thinking in your head. Not being super skilled with the vocabulary or this blogging platform, I'll try to give you guys pictures in lieu of excessive wordage in these columns. And if you have any questions… tough kiddies. Eat wit and pie! Today I bring you something that is sure to amuse your bouche. I call these Fire Crackles. It's pork shoulder and ham y'all! 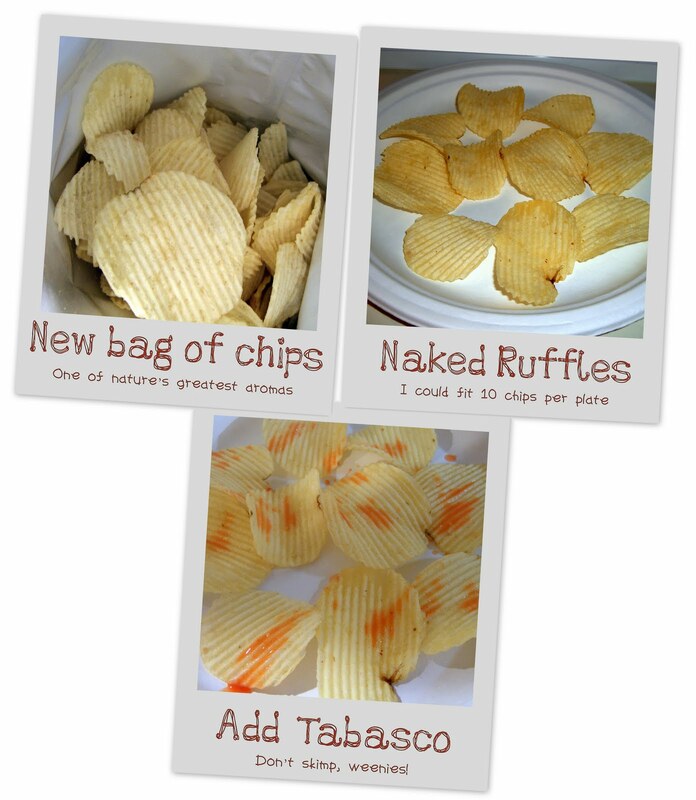 How was "Ruffles have ridges" ever an effective marketing campaign? What is wrong with people?! America… English language experts… Can we agree on a single spelling and go forward? It is the twenty first century for diced sake. A sauce so important that I was taught it in my Louisiana History class in Middle School. 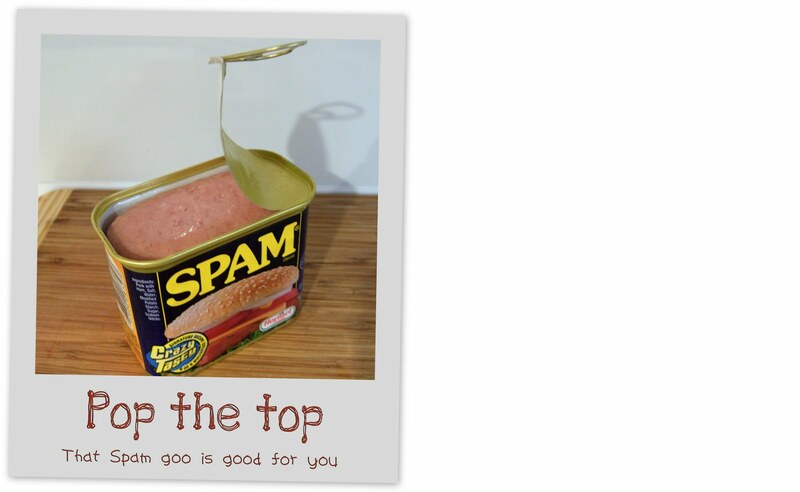 STEP 1: Pop the top on the Spam. Oh, the sound of the Spam coming out is unique and wonderful. 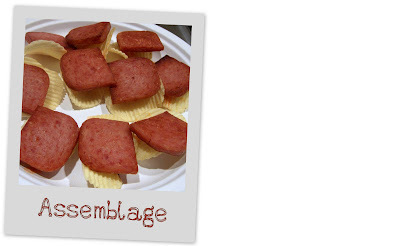 STEP 2: Slice the Spam. Cut the loaf in half crosswise from the top. Rotate the two pieces to lay lengthwise on the cutting board and slice these crosswise. Don't sweat the size, just don't make it too thin or too thick. I ended up with 20 square-ish Spam pieces. 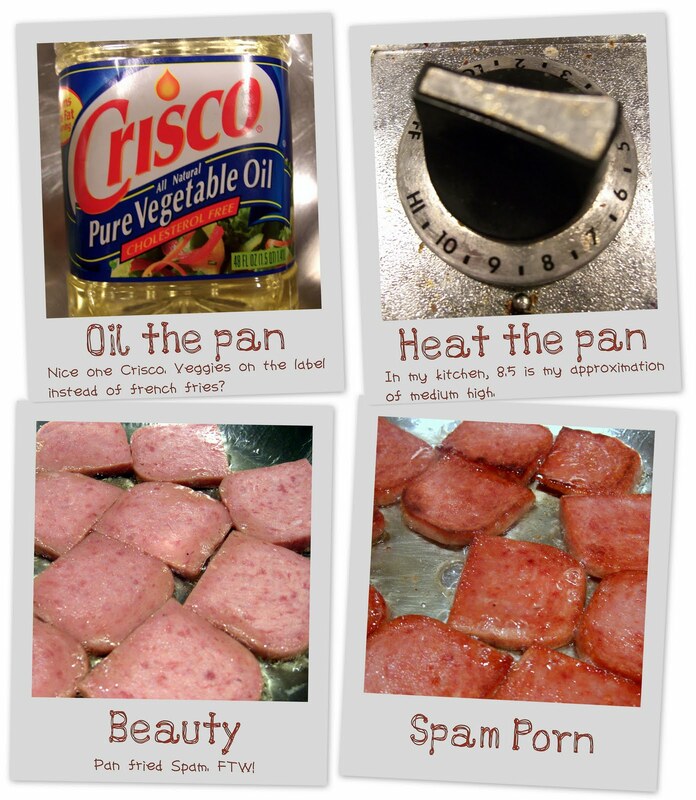 STEP 3: Pan fry the Spam. 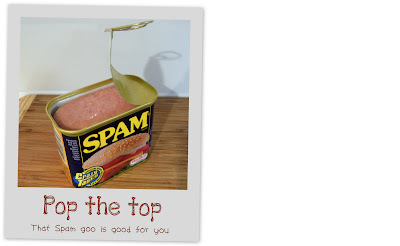 Raw Spam tastes like crap. You need to cook this stuff. Find a pan and (if you are like me) clean it. Spray the pan with Pam, toss some butter in there, or drop a little oil in the pan if you want. I used half a cap full of veggie oil. Flip your stove's knob to something between full blast and halfway. 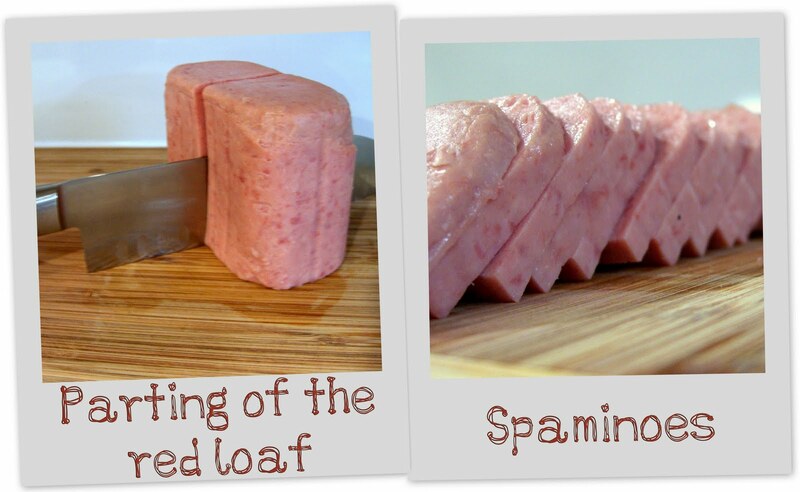 Lay your Spam slices down and brown both sides (1-2 minutes per side depending on your heat). Be sure to get a good crust on the slices. When you start to see the edges dry up, they are getting close. 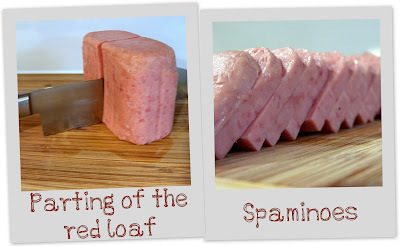 My pan fit 10 slices, so I cooked the Spam in two batches. STEP 4: Lay out your Ruffles. Give all the chips a healthy few dashes of Tabasco. 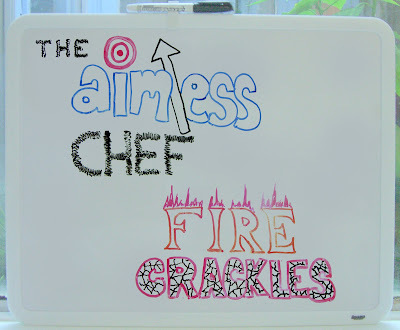 STEP 5: Assemble Fire Crackles. Lay Spam slice on each chip. Garnish is normally for haughty food freaks. 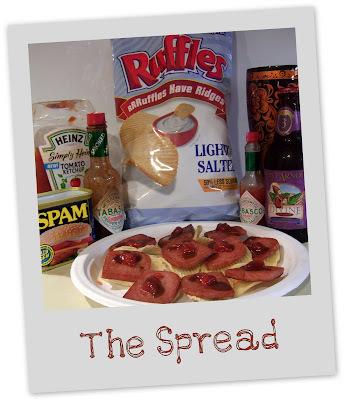 In fact, garnish and Spam may not ever have been put in the same sentence. Show some pride and blob a bit of ketchup on top of each of these. 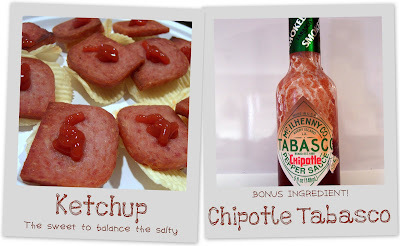 If you want to take it up another notch, dash some more Tabasco on top (The Aimless Chef suggests Chipotle Tabasco). 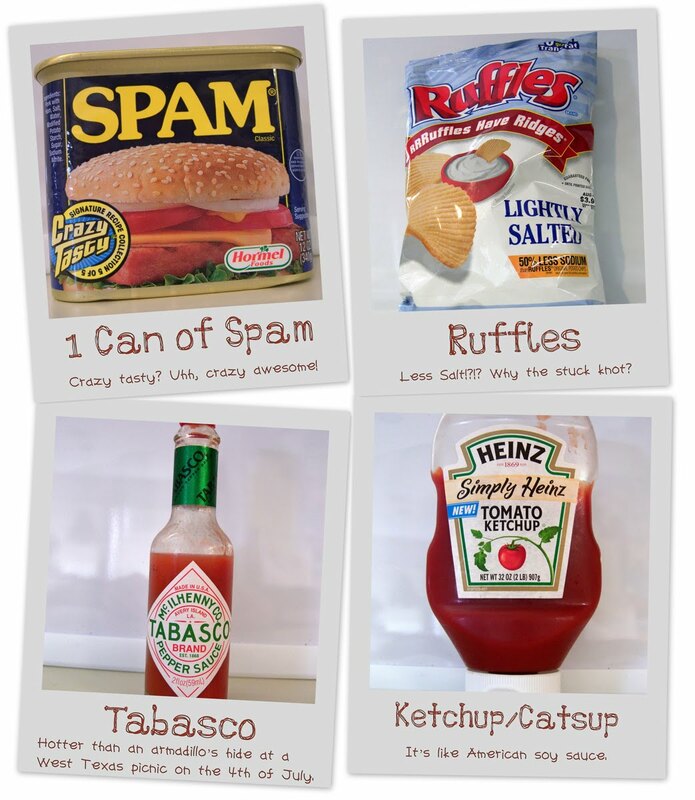 Whatever you do, don't be condiment a snob. The sweetness of the Ketchup is essential to this recipe. A meal this special deserves a great beer. I went to my beer fridge and pulled a Saint Arnold Divine Reserve 3 (Double IPA) from my lagering shelf. 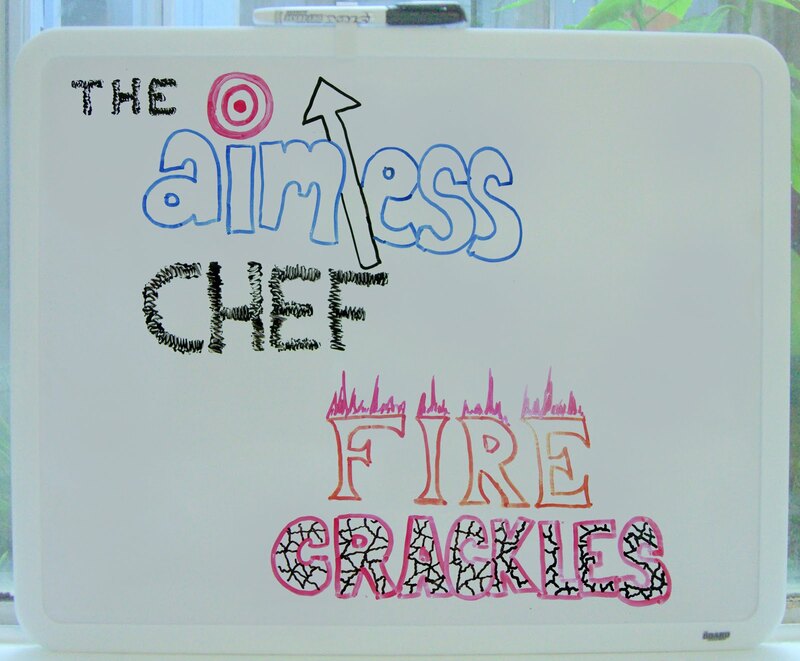 Something bold and hoppy will pair nicely with Fire Crackles. Six simple steps, that's all you need. Six simple steps and you will succeed. Good appetite my friends. Peep this how I freaked that in the slide show below, yo. This recipe screams to try scrapple in place of the spam. I encourage healthy snogging with food in the kitchen.